THIS multi-part series has thus far shown conflicts of interest aplenty (see part 1, part 2, part 3 and part 4 if new to this series). We covered the role played by Andrej Matijević and Željko Topić (EPO) in Lufthansa favourism and in the previous part we showed the connections of Tena Mišetić and Ivan Mišetić (also Lufthansa). Let us not forget that a conflict of interest is the precursor to corruption. 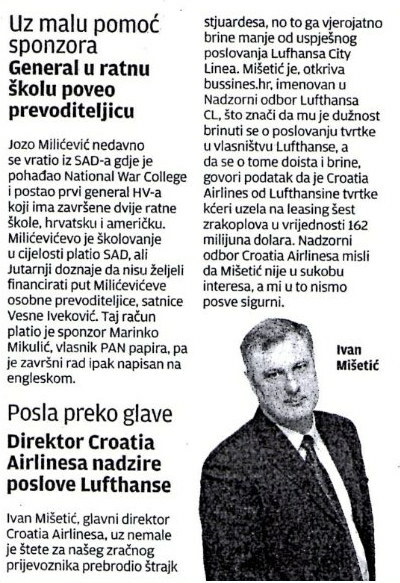 The opaque symbiosis between Croatia Airlines and Lufthansa (annexed article #15), whose links are graphically illustrated by Ivan Mišetić, opens the door to speculation and openly voiced suspicions about Lufthansa’s clandestine ownership of the Croatian airline as reported in the media in Zagreb and beyond. 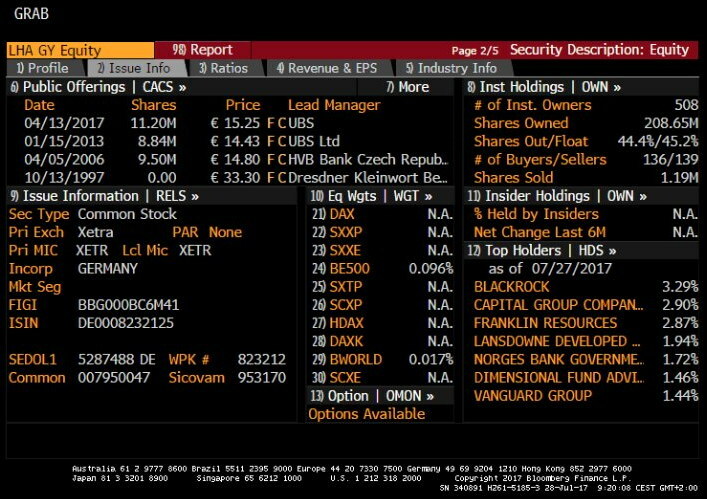 But let us return to the main protagonists in the corruption affair surrounding the company Lufthansa Airplus Servicenkarten GmbH, headquartered in Neu-Isenburg, Germany. In the annexes of this article, we provide exclusive information on the company’s ownership structure (annexed document #5). 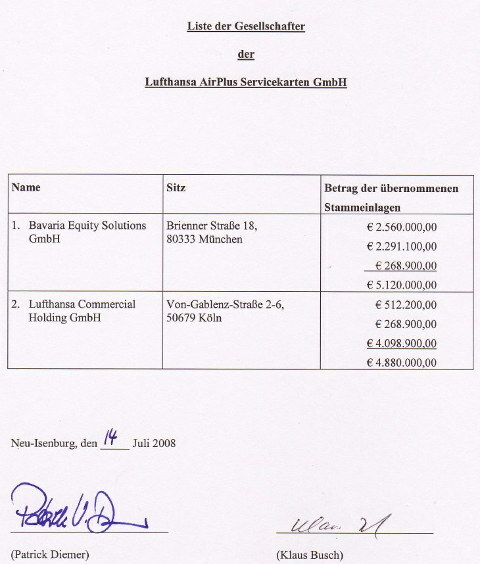 As can be seen in this figure, the registered capital of the Lufthansa subsidiary is 10 million Euros. The founders are the companies Bavaria Equity Solutions GmbH from Munich and Lufthansa Commercial Holding GmbH from Cologne. The annexed document is dated 14 July 2008 and was signed by Messrs. Patrick Diemer and Klaus Busch. 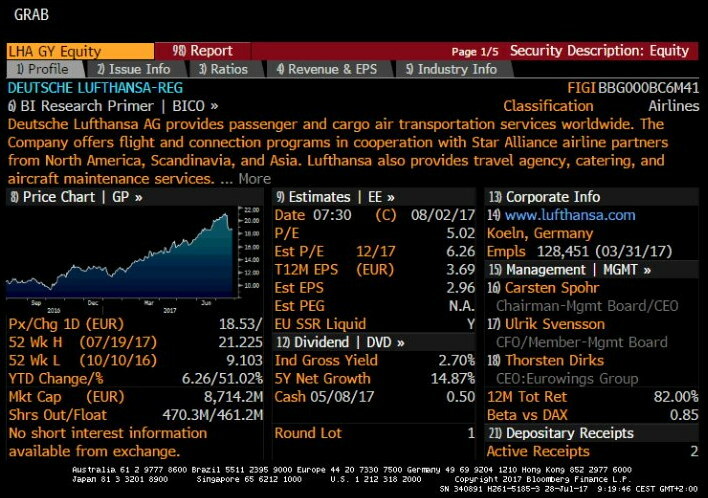 The latest data from the Deutsche Börse (XETRA) for the company Lufthansa AG is also provided (annexed exhibits #6 & #7). Wir möchten daran erinnern, daß der Interessenkonflikt Vestibüll der Korruption ist. Diese nicht transparente Symbiose zwischen Croatia Airlines und Lufthansa (#15), welche bildhaft Ivan Mišetić verbunden hat, öffnet die Möglichkeit für Spekulationen und offene Verdachte über verheimlichtes Eigentum der Lufthansa an kroatischer Luftgesellschaft und worüber Medien in Zagreb und breiter berichtet haben.